Hello, friends! Just a quick update! I may not have any more deadlines for a while (Yay!) but life is still as busy as ever! I’ve been enjoying a wonderful few days, celebrating the impending Christmas season with friends and family. A few of my girlfriends and I had a Christmas crafts night. Then my mom and my sister and I took a trip downtown to see the world premiere of the opera Becoming Santa Claus. The new book is doing great. And Boy Band is getting some new love because of it! I’ve had two reviews in the past week that I particularly love. One is from a new friend down in Mexico named Bryan. You can check out his review here! He also took this fabulous picture and I’ve got to be honest, it’s one of my favorite book portraits ever. The other is a review I believe I already shared, but I love it so much, I’m just going to share it again. I love all my readers and reviewers and friends so, so much! I don’t know if you realize it, but you make so many dreams come true just by doing what you love! Thank you, thank you! I hope you all are enjoying this most wonderful time of the year. Hi, friends! Well, the new book is out, I enjoyed a wonderful evening at the Sanger Library as my last public book even for the year… I’m ready to enjoy the holidays! It’s funny, I’ve had so many deadlines this year that every time I look at my phone and see the date, I think, “Oh my gosh! I need to hurry up and…” And then I remember that I HAVE no more deadlines this year! Yay! It’s a pretty great feeling. Not gonna lie. And I’m proud of myself for sticking to them. Now I just have to get them out of my head and relax and enjoy. I’ve never considered myself a workaholic, but I am very goal oriented and I usually have to have SOMETHING I’m working on or toward or else I just don’t know what to do with myself. But I DO have a lot of things to work on. For one thing, I’m beta-reading my good friend’s first book! Her name is April, but you might know her as A Well Read Woman. I’m very much enjoying her book. It’s taking me a bit longer to read than most books, however, because I’m going through and making notes. I really enjoy beta-reading, especially because it means I get to read books before they’re released! April was also sweet enough to read Boy Band and she wrote one of my most favorite reviews of all time. And no, I don’t JUST love it because she included a One Direction gif. After I’m finished beta-reading, I’m really looking forward to reading the rest of the books on my TBR list for 2015. I’m not sure I’ll finish them all by January 1, but I WILL finish. If I could have one wish this Christmas, it would be for independent authors everywhere to enjoy the same amount of recognition, respect, and readership as our traditionally published colleagues. If you have a reader in your life, visit Amazon.com or BarnesAndNoble.com and check out an independently published book. I guarantee you you will make an author’s Christmas dream come true. A reader’s as well. Hello, friends! How are all of you? Sadly, I am still battling The Crud. I thought I was getting better, but then Monday night I had a bit of a relapse and it hasn’t gone away. It’s not horrible, but it makes you feel just gross enough to not want to do anything. Blah. Thankfully, I get to work from home so I don’t have to go out and infect the rest of the world. Unfortunately, in my sickly state, I don’t want to work. I just want to sit around and snuggle with my kitty and watch Disney movies. As I was getting ready for bed last night, I couldn’t help but think that this virus has seriously gotten in the way of my Christmas shopping. And THAT gave me an idea for a blog post. The Best Gifts To Give To Your Writer Friend This Holiday Season. Books. This one, I think, kind of goes without saying. We’re writers. The only thing we love more than writing is reading. You can never go wrong with books. Gift Cards. Let’s face it, most writers are poor. And even if we’re not, we can be hard to shop for. Gift Cards, especially to Amazon.com, Barnes and Noble, or Starbucks are always appreciated. A Bottle of Wine. Insert stereotype that authors really, really, really like to drink here. Scented Candles. Okay, maybe this is just me, but I love lighting a scented candle while I work. It brings me so much peace and makes my work environment so pleasant. Scarves. We’re writers. We love scarves. Homemade Cookies. Honestly, this is probably the best present of all. I’d so much rather have a good friend make me something (especially something chocolate) than go out and buy me something. A Book Review. The very best gift you can give to any writer anywhere is a book review. Just a few short sentences about how much you enjoyed their book. Book reviews are invaluable to writers. It’s free and it only takes about three minutes of your time, if that. Best. Present. Ever. Giving Their Book as a Gift. You want to make a writer’s holiday season merry and bright? Give their book as a gift to someone else. That is better than buying the writer themselves a car. Okay maybe not, but it’s almost just as good. Donate to a Good Cause. Last year, instead of buying gifts, my mother donated to charities in our relatives’ names. I thought that was a great gift. Great causes to donate to for your writer friends include literacy and education charities. Also the Humane Society because everyone loves animals. Quality Time. To me, nothing is better than quality time spent with those you love. Take your favorite writer friend out to dinner, or go drive around a look at Christmas lights and drink some hot chocolate. Bake cookies and watch a Christmas movie. It’s the season for gift-giving, true, but it’s more so the season to love and appreciate the people in your life. It’s the moments, not the gifts, that will last a lifetime. It’s the final month of 2014. It’s a time for wrapping things up, but it’s also a time to think about new beginnings. As a matter of fact, in the Episcopal Church, Advent is the beginning of the New Year. We’re just kind of rebels that way. Anyway, I have a lot of goals for this new month. And I know it’s going to be a busy month, so I should probably get a head start on all of them! My first December goal is to finish at least one of my works in progress. I genuinely believe I can finish the first draft of the Chick Lit YA book that I began working on for NaNoWriMo. It’s just been so easy to write and it’s a whole lot of fun. I’m thinking (or at least hoping) that I might be able to get it out fairly quickly. My next goal is to put together a Jones Family History Scrapbook in time for our semi-annual holiday get-together. I’ve been doing a lot of research into both sides of my family tree. At first, I thought my dad’s side was more interesting than my mom’s, but that’s only because he had a lot more to find at the beginning. It turns out on my mom’s side there are Sons of the American Revolution, Lords, Ladies, Kings, Queens, and Native Americans. I thought that was SO cool, especially because I’ve lived my entire life thinking that I was fully European. But as it turns out, my 9th great-grandmother was a member of Powhatan tribe. It’s all so fascinating to me, so Im really looking forward to sharing it with my family. Thankfully, I don’t think any of them actually read this blog, so it should be a surprise. I’ve also stared an Ancestry board on Pinterest to kind of sort of help me keep track of everybody. Third goal is to clean out and donate all the stuff I no longer use. This is actually kind of a never ending goal as every time I get rid of stuff, more stuff seems to appear out of nowhere to take its place. I still haven’t quite worked out the physics of this phenomenon, but I am constantly trying to overcome it. I’d love to be a person who exists with as few material goods as possible. I really don’t like clutter and I don’t like spending money on stuff that I don’t need and rarely use. Unfortunately, I’m also a very sentimental person and I have a hard time giving away gifts or things that meant a lot to me or someone I love. Fourth goal is, as always, to keep spreading the word about Cemetery Tours and hopefully get some holiday book sales! Ghosts are great for Christmas! Doesn’t everyone know this? Hey, only three days in and already 137 have signed up to enter my new Giveaway! If that isn’t an awesome Christmas present, I don’t know what is! What are some of your holiday/end of the year goals? Well, here we are! I can’t believe we’re already to December. I hope all of my American friends had a wonderful Thanksgiving holiday, full of family, food, and all around good times. I hope all of my non-American friends had a just as splendid weekend with just as much food, family, and good times. Much like the first event, I will be giving away TWO signed copies of BOTH of my books in celebration of the holidays! I know what you’re thinking. Ghosts are for Halloween, not Christmas! Well I think a man named Ebenezer Scrooge would disagree with you! If ghosts at Christmas are good enough for Charles Dickens, then they’re good enough for you too. Also, as it is officially December, NaNoWriMo is officially over. I’d like to offer my sincerest congratulations to those who made 50,000 words! Sadly, I am not one of them, but I kind of realized I wasn’t going to be around mid-November. There was just way too much going on! However, I am so very happy that I participated in NaNoWriMo, because it got me writing a new book that, before, I hadn’t even considered. Now, I’m 32,000 words in and I’m hoping to finish sometime this month! It’s so much fun and I’m still really loving it. Of course, Cemetery Tours 3 is still in the works as well! I’m so excited, because I’ve had several reviewers mention that they can’t wait for the third one! I hope it lives up to their expectations! It’s funny. I always tried to keep my expectations for life and for my writing career moderately low. At least, I pretend that they’re low. That’s because every day, you hear things like, “You’ll never make money writing,” or “This will never be a full-time career.” I don’t want to seem naive or ignorant, so I go along with it. But the truth is I want it to be my career. I want this to be my living. Yes, it’s a long shot, but this is the only life I’m going to get. I might as well try. Anyway, I wish you all a very happy December! Keep reading, keep writing! Hello friends and fellow writers! How goes it? I hope you are all warmer than I am. 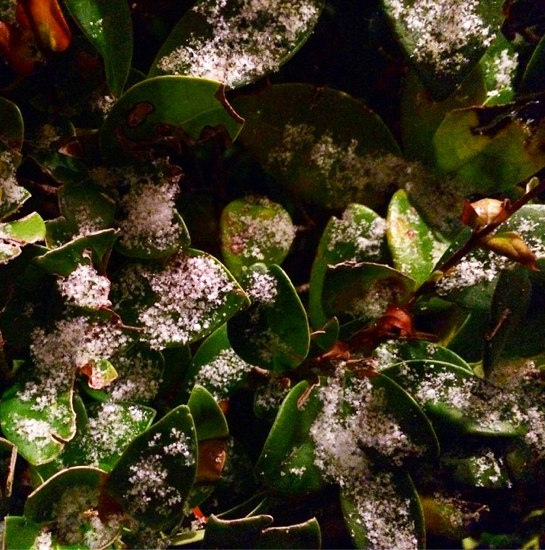 In case you don’t know anyone who lives in Texas, it totally snowed here last night. So yeah, it is uncommonly cold around here for November. I mean, I actually really love snow. 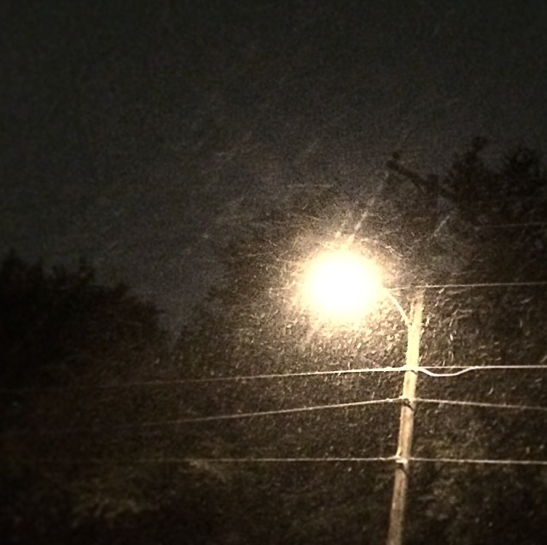 It’s so rare here that every time it comes, it’s like seeing snow for the first time. Of course, I’m not a fan of the hazardous driving conditions (both the roads and already dangerous Texas drivers), but I love snow itself. It’s magical. As far as NaNoWriMo goes, I’ve fallen a bit behind. I’m still working on my book every single day, but if I’m being totally honest with you and myself, I’m not thinking I’m going to finish it by November 30. Why, you ask? Several reasons. 1) I’m fairly certain the book is going to end up being longer than 50,000 words. 2) I’m still working on Cemetery Tours 3. 3) I’m going out of town this week to see my sister in her first professional musical production. 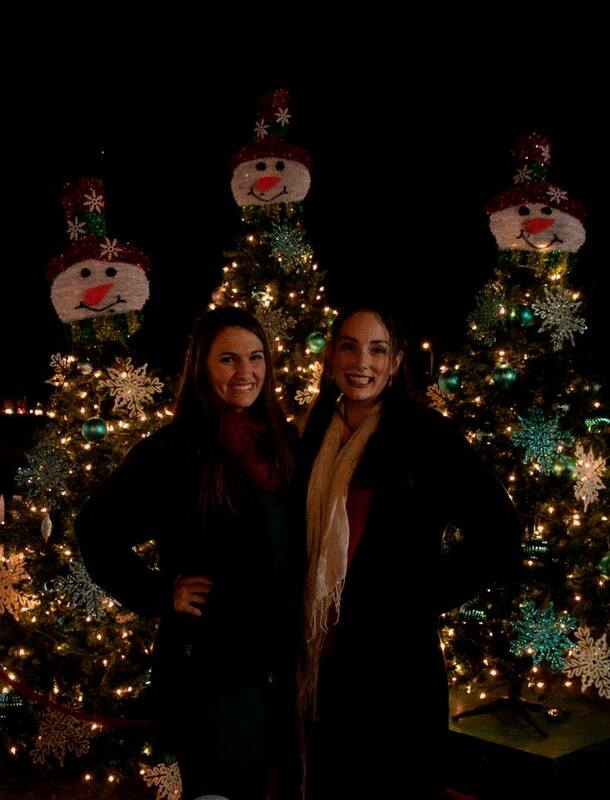 4) My sister is coming home for Thanksgiving next week and I plan on spending as much time as possible with her. 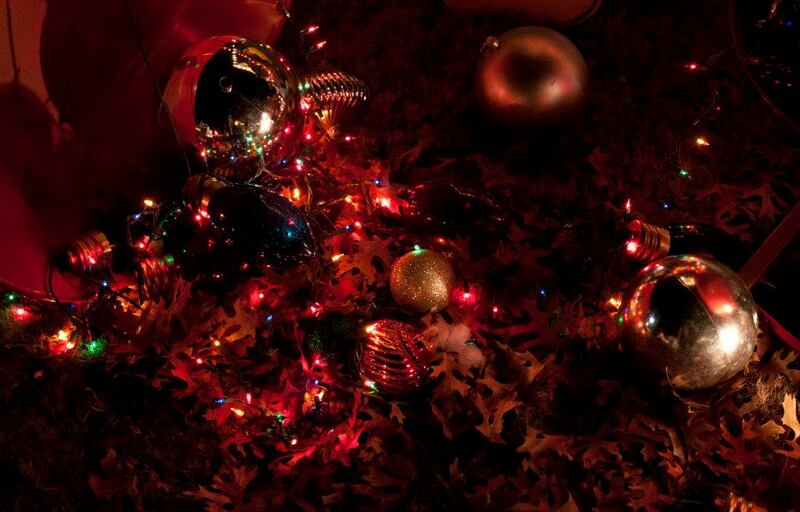 5) The holidays are a time for family, not obsessively trying to finish a novel. It is very important to finish what you start, but for me, finishing this book in thirteen days is not worth what I would have to give up with my friends and family. Don’t get me wrong. I WILL finish this book. I absolutely love it. I’m having a blast writing it, and I do think NaNoWriMo is still a good thing. It encouraged me to begin this project that I wouldn’t have even touched otherwise! Now I’m kind of thinking I’ll be ready to publish it before the next Cemetery Tours! But I’m not sure I’ll be one of the ones who is able to claim that they finished within thirty days. And that’s okay. Again, I’m so thankful that NaNoWriMo exists. I’m going to participate every year, I’m sure. I might never finish within the thirty days, because let’s be honest, November is a crazy busy month! It’s the beginning of the biggest holiday season of the year! But I will finish it. That’s a promise. So… How was YOUR Christmas? I only had one glass of wine yesterday, but I definitely have a Christmas hangover. 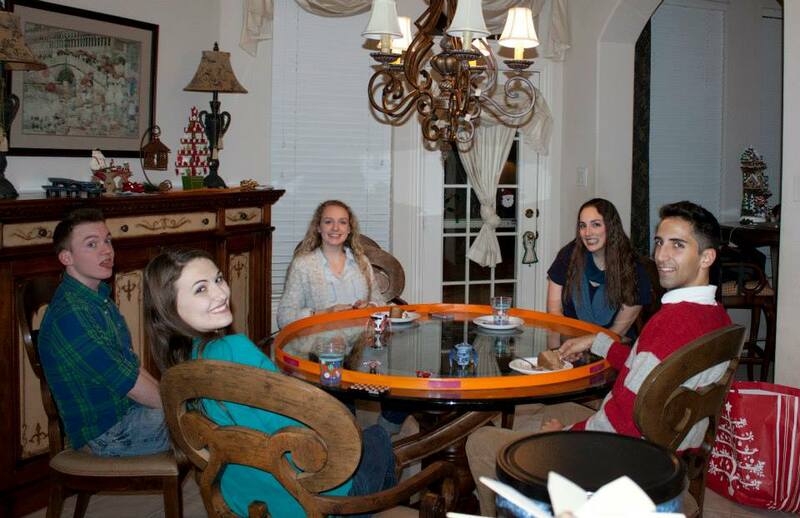 Way too much food, fun, and laughter. Not that that’s a bad thing. 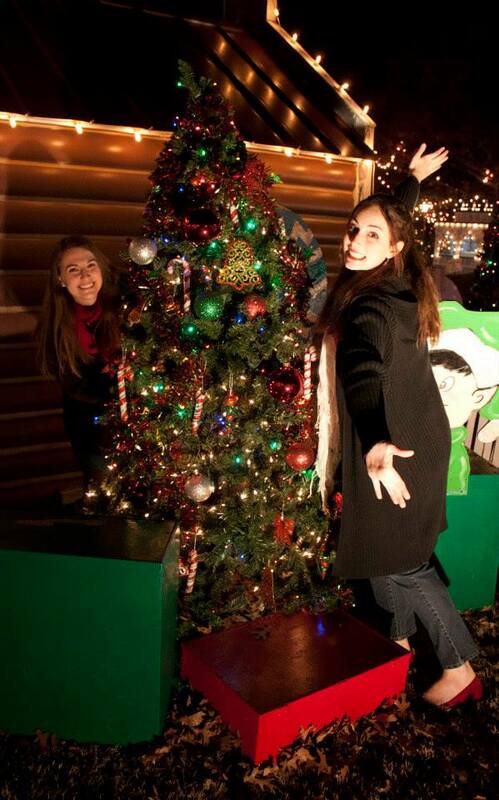 The holiday festivities began with our annual Christmas Eve trip to Santa’s Village. Santa’s Village is a fun little thing that the Public Library does every year. They set up a bunch of little fun houses for kids to go in and get cookies, Christmas ornaments, write letters to Santa, etc… My sister and I have outgrown the actual houses, but it’s still fun to walk around and look at lights. I’m sure the look of sheer alarm and panic that poor Mrs. Claus sent me at that moment mirrored my own stunned expression. It only took me about half a second to recover. “Okay, then, thank you, Mrs. Claus!” I said and quickly ushered my cousins out of her house. Anyway, that’s one of my favorite Santa’s Village stories. This year’s trip wasn’t quite as eventful. 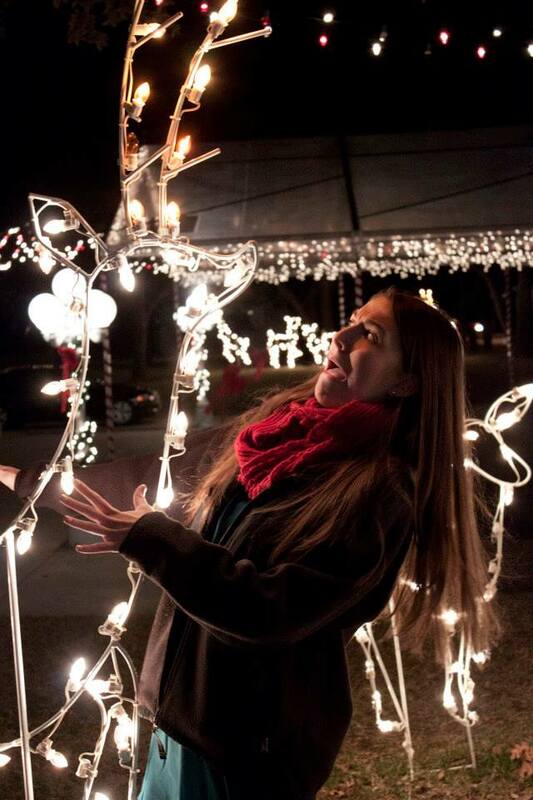 Although, my sister almost did get run over by a reindeer. Afterword, we went to Midnight Mass. It’s a beautiful service. We sang my favorite Christmas Carol, “A Stable Lamp is Lighted.” However, being the High Church Episcopalians that we are, we had incense that not only stinks up the entire church, but also stinks up your hair and your clothes. Seriously, that smell sticks with you. I also happened to be acolyting, so I had to stand right behind the thurifer (or the guy who swings the incense). At one point, I took a deep breath because we were singing “O Come All Ye Faithful” and I inhaled a mouthful of that holy smoke and started choking in front of the entire church. Fortunately, Episcopalians are really into their Christmas music, so no one noticed. After the service, we headed home to wait for Santa. 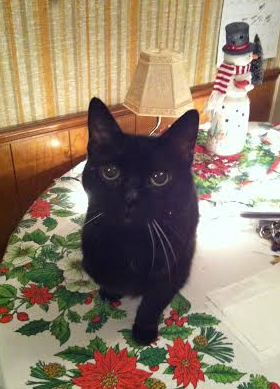 Midnight was excited for Santa also, even though she knows climbing up on the table might land her on the naughty list. After about three and a half viewings of A Christmas Story (“Agggggghhhhhh I can’t put my arms down aaaaghhhh!”), we finally headed to bed to wait for Christmas morning. We had a lot of surprises waiting for us! For example, I got a whole elliptical! I love it! I only hope it isn’t my parents’ way of telling me I need to work out more. I also got Monsters University and Allegiant, so I’m a pretty happy camper. 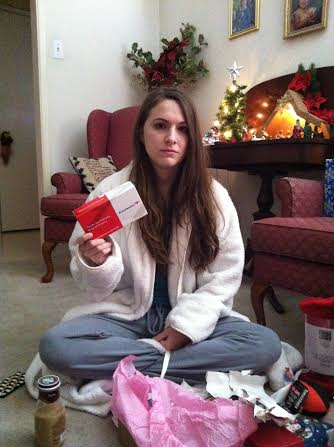 She told my parents that she wanted checks for Christmas. Well, they delivered. (She actually got some really great presents. This photo was just too funny to pass up). After a morning of Christmasy goodness, we headed back to our friends the Kisers’ place (In case you don’t remember them, they’re the ones we spend every Thanksgiving and Christmas with… https://jackiesmith114.wordpress.com/2013/11/29/its-the-holiday-season/). I’m not even sure how the tradition began. We’ve all just been friends forever. The stories I could tell… maybe one day I’ll write a book. The Annual Kiser-Smith Holiday Shindigs. Mr. Kiser always has a fun new holiday toy for us to play with. 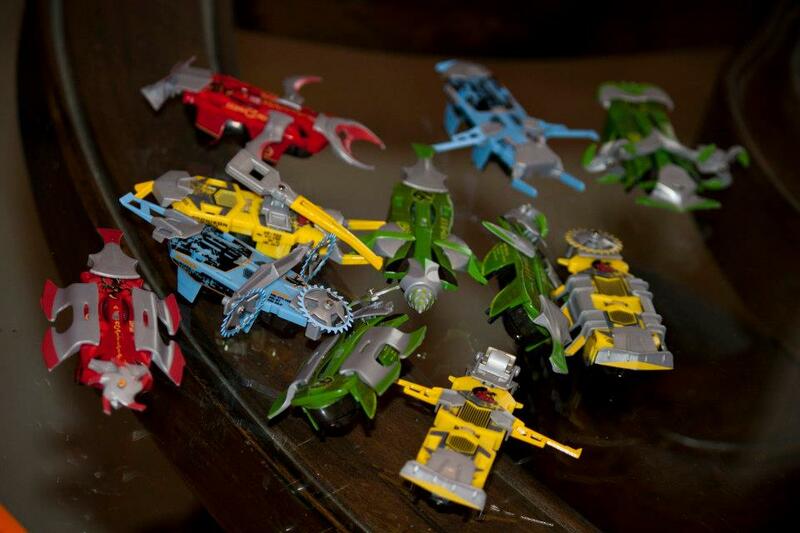 Last year, it was Robot Fighter Bugs. I named mine Horatio. 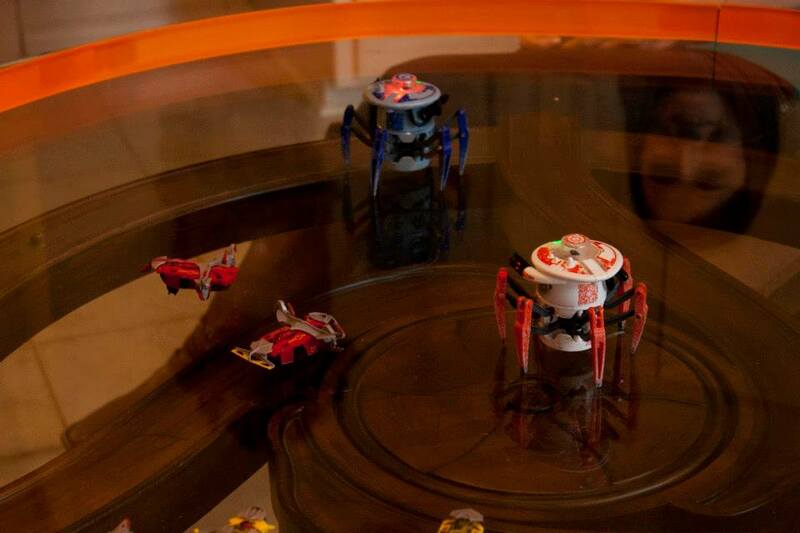 This year, it was Robot Fighter Spiders. Remote controlled and slightly bigger and creepier, because they actually walk on creepy little robot legs. 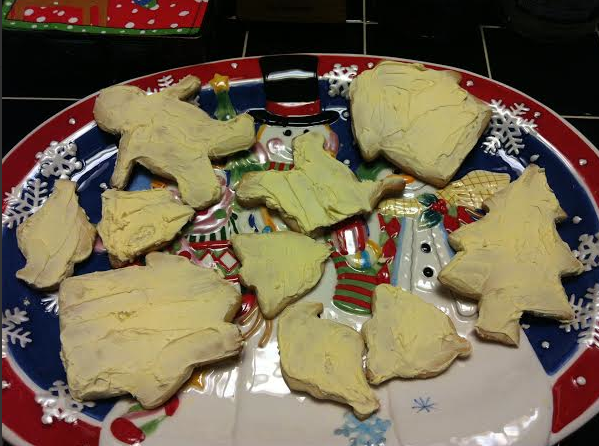 Just like any good Christmas gathering, there were Christmas cookies. However, if you look closely, you’ll notice that someone ate the head off of one of the gingerbread men and then put him back. Morbid. And a little gross. We (the “kids”) took a Christmas walk to the park. 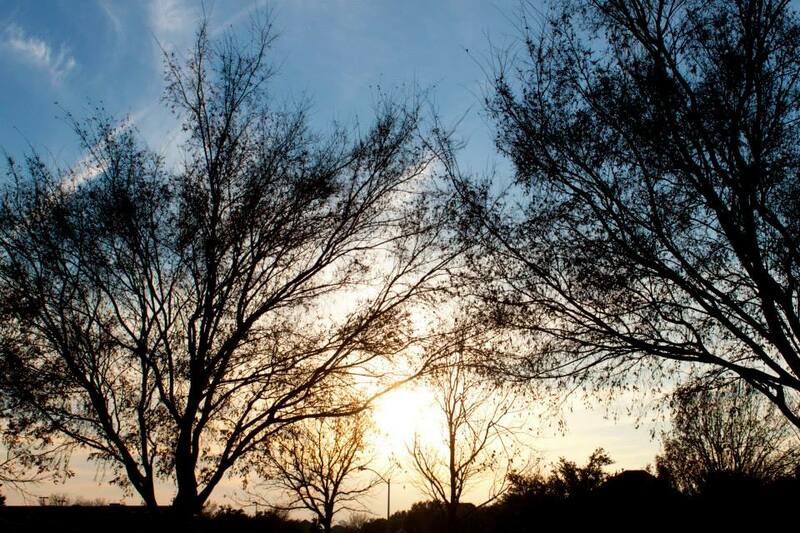 December Skies in Texas are actually very beautiful. 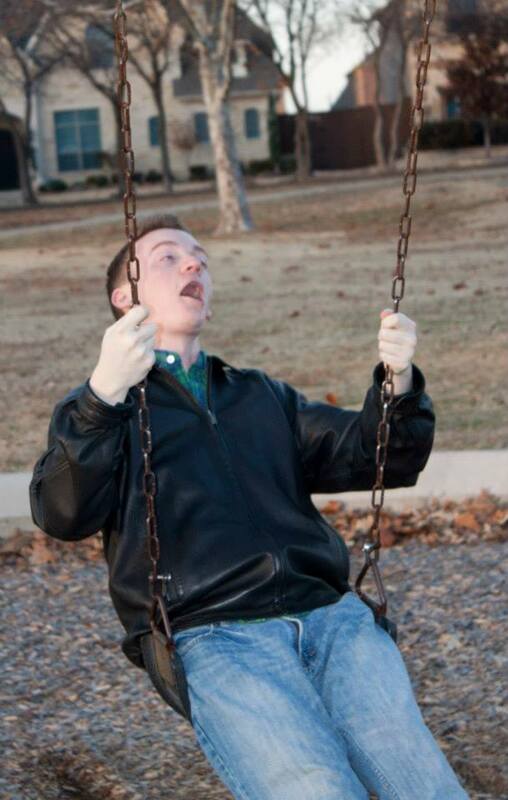 We’re all adults, so naturally, we played on the swing set. This is Bobby, my brother for all intents and purposes. While we were at the park, we met the absolute cutest little boy named Keegan. He came right up to us, with his dad looking on, and began patting our friend Ashwin on the leg and saying, “Buddy… buddy.” Then, he walked over to Bobby’s little sister, Jenny, and said, “What a mess!” His dad explained that he’d had a lot of health problems, and that he really liked playing with big kids. I got a high five from him. So, so, so cute. I hope he had the best Christmas ever. 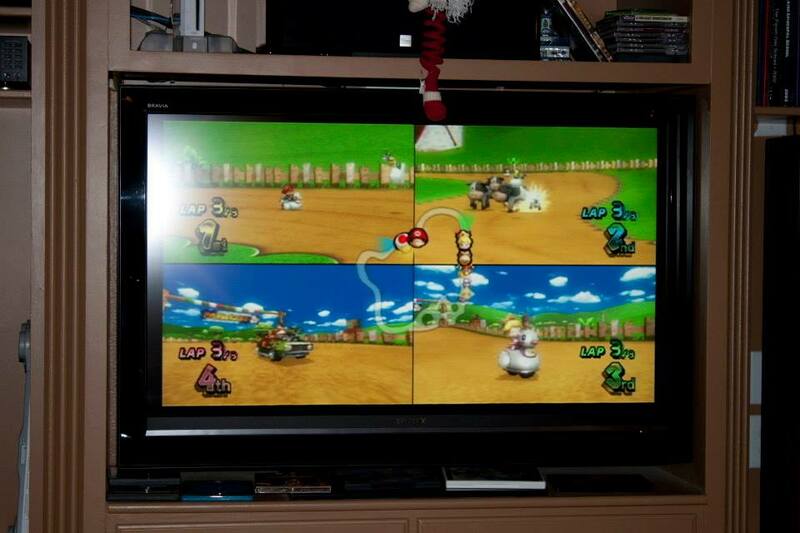 After that, it started getting really cold, so we scurried back to the Kiser home, where we engaged in another holiday tradition: Mario Kart. She came in third place!!! It’s actually a Christmas Miracle! 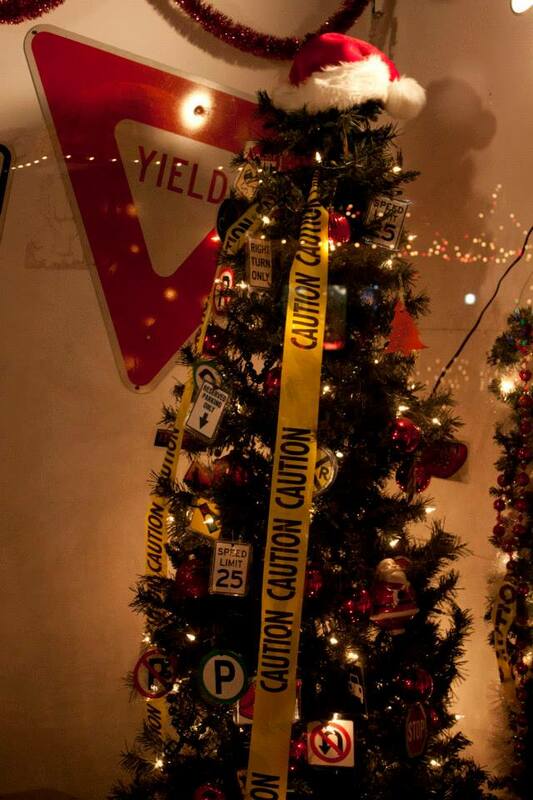 I don’t know how to bring up the highlight of our Yuletide Celebration, so I’ll just say it. There was a toilet. Yes, you read that correctly. 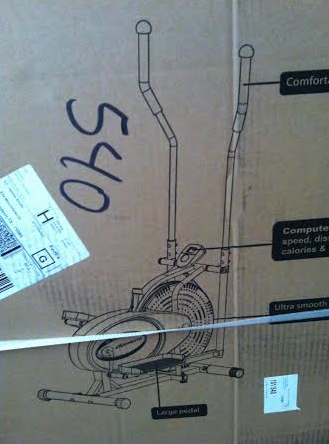 Jenny got a toilet for Christmas. 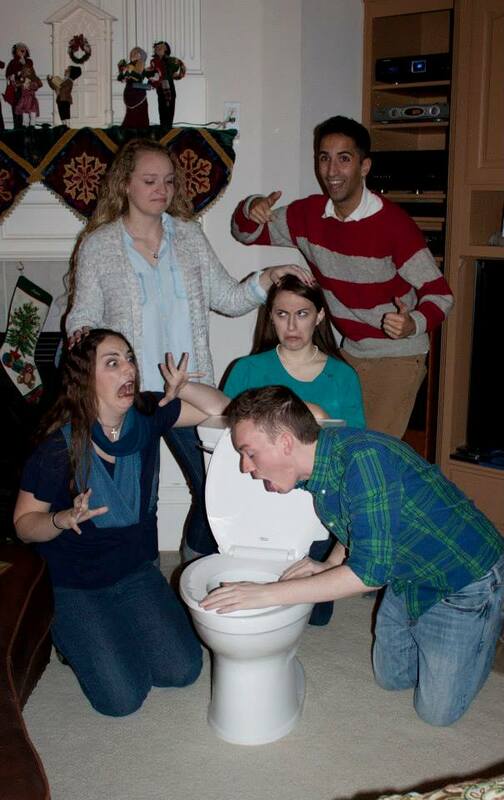 It actually wasn’t the first Christmas toilet in the family. Bobby got one when he and I were still in high school. Let me tell you, he was not amused. His mom (and the rest of us) thought it was hilarious, but he was so angry. It was just about the funniest thing. 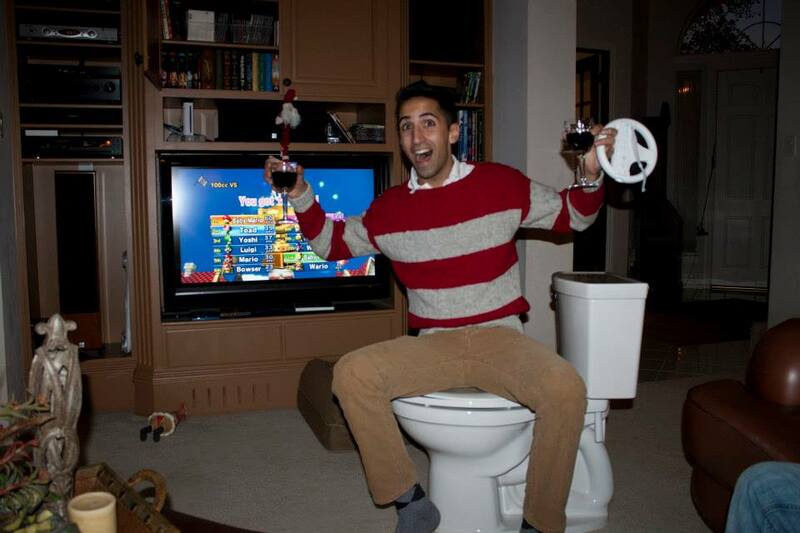 Now that we’re older though, we know how to appreciate the value of a good Christmas toilet. He’s over 21, I swear. 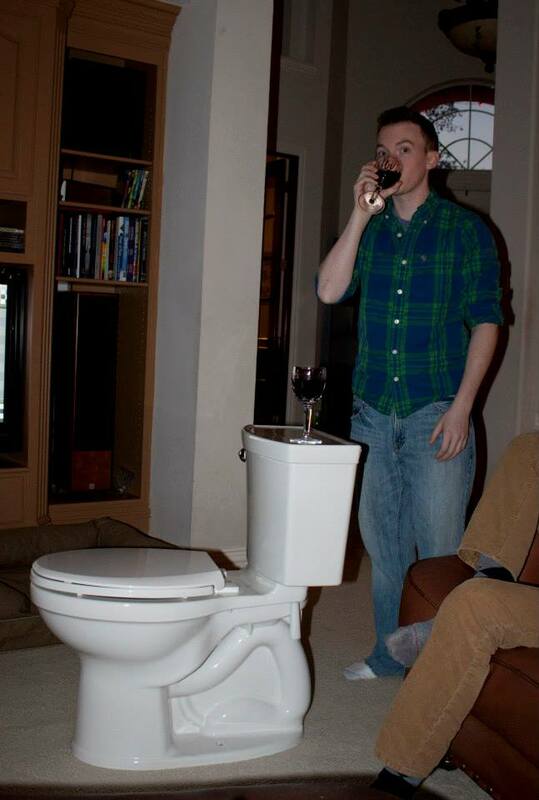 You can use it as a wine table. 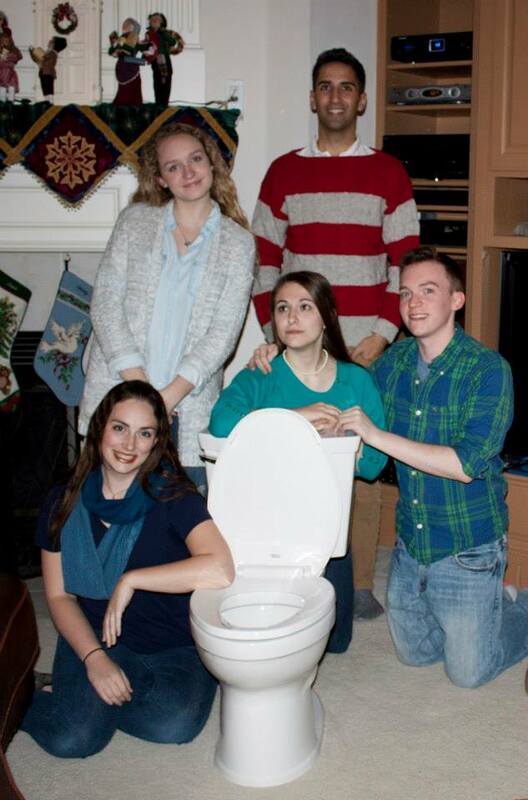 And of course, you should never pass up the opportunity to take an Awkward Family Christmas Photo around the toilet. 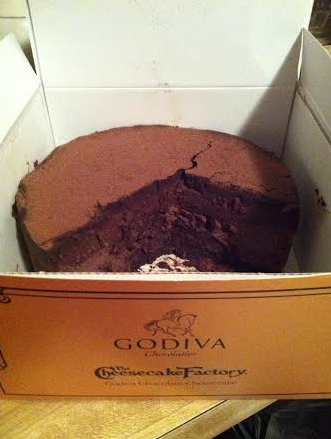 The evening ended with a delightful chocolate cheesecake dessert. Good thing I got that elliptical, because I’m not letting this beauty go to waste!!! Dessert and more battle bugs. I hope everyone had the most delightful and merry of Christmases! CEMETERY TOURS IS ONLY $0.99 ON KINDLE! Just a quick note here before I go to work. In honor of the holidays, Cemetery Tours is only $0.99 on Kindle today! Tomorrow, it will be on sale also, but it will $1.99 beginning around 3 PM Pacific Time. Cemetery Tours Countdown to Christmas! It’s the holiday season, so to celebrate, I will be hosting another Kindle promotional deal! This promo is a little different than the last one. Next Monday,December 9, Cemetery Tours will be $.99 on Kindle. It will stay $.99 until about Tuesday at 3. Then, it will be $1.99. It will be discounted until Friday, December13. If you already have Cemetery Tours on your Kindle, then please still RSVP and share this event with your friends. I would love it if this event could be as successful as the last one! Thank you all and Merry Christmas!